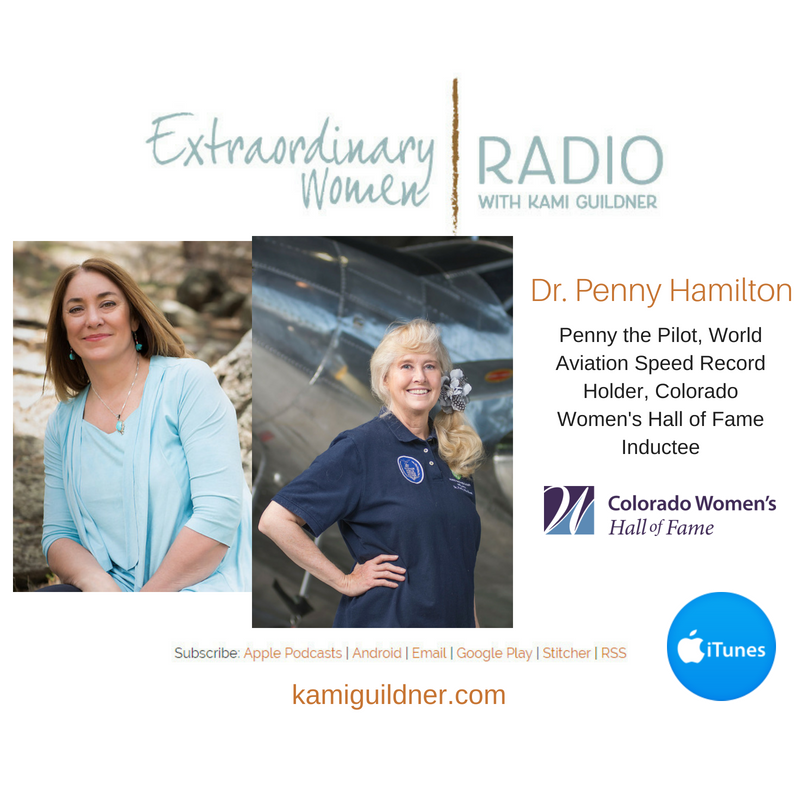 Today on Extraordinary Women Radio, I’m bringing you a Colorado Women’s Hall of Fame Inductee, Dr. Penny Hamilton. Penny Hamilton has been a general aviation pilot for 23 years, marking her as one of a select group of women in her field. Dr. Hamilton has worked for decades to encourage women to choose aviation as a career and break down the barriers that keep women from taking to the skies. Dr. Penny co-holds with her husband a World Aviation Speed Record, set on October 22, 1991. In 1994, the (FAA) named a new holding intersection west of Corona Pass at an altitude of 15,500 feet above sea level after Penny as a part of the U.S. aeronautical system. Penny has also been inducted into the Colorado Aviation Hall of Fame. And was was honored the Amelia Earhart International Forest of Friendship Award. National Aviation Day is coming up on August 19 celebrating the role aviation has played in our history, our present and our future. And Penny is particularly passionate about sharing women’s role in aviation history. Did you know that Katharine Wright funded the Wright Brothers first flight? As Penny shares, “Her story was his story,” and she she shares some of the historical relevance that women have played in the role of women in aviation. Yet, today only 7% of pilots in America are women in America – 93% are male. Penny is passionate about changing this. She is the director of the Teaching Women to Fly Research Project, which is dedicated to bringing more women into aviation. Penny shares how she broke through her own fear of flying solo, and how she applies a “flight plan” to her life, breaking through any fear that steps in her way so she can live life making a difference in the world. As a 2x cancer warrior, Penny believes in the power of visualization for breakthrough, and encourages us to apply this in life and business. She talks about the spiritual connection she has found in the art of flying – what it’s like flying solo up and above the world! For more than 25 years, Hamilton has been teaching preschoolers and elementary children about the history of women in aviation with a program called “Penny the Pilot.” For this contribution to, the FAA bestowed on Dr. Hamilton its Champion of Aviation Education Award and ABC-TV in Denver recognized her with its Everyday Hero award. To learn more about Dr. Penny Hamilton, visit her web site. I’m honored to introduce you to the delightful Dr. Penny Hamilton, also lovingly known to many as Penny the Pilot! She’s such a dynamic woman in person! Very inspiring. Isn’t she?! I love her!